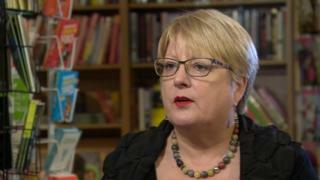 A bookshop owner and publisher has accused the publicly-funded body responsible for promoting Welsh books of "undermining" the industry. The Welsh Books Council (WBC) wanted to open a temporary shop in Cardiff but scrapped the idea after a complaint was made. It came from Hazel Cushion who runs nearby Octavo's book shop which buys its Welsh language books from the WBC. The WBC confirmed the shop would not open. "We are a customer of the Welsh Books Council, we actually buy all our books in the Welsh language, and a lot of the Welsh-published books, directly from the books council," said Ms Cushion, who was shortlisted for the 2017 Independent Bookshop of the Year. "It would be a bit like a meat supplier suddenly setting up a shop selling turkeys right next to one of their major customers. It just seemed a really extraordinary idea. "I would've thought they would have been championing us every step of the way, rather than trying to compete with us. "I do feel it demonstrates how removed they are from the reality of book selling and publishing in Wales." But the WBC's chief executive, Helgard Krausse, said it was operating within its remit and a separate temporary shop had successfully operated in Machynlleth, Powys. "The original location was planned to be right in the centre of Cardiff, and Hazel herself would've welcomed a pop-up shop for example in the central library. "There was never a plan to open a bookshop directly near Octavo books in Cardiff. "And I think when I spoke to Hazel about the process that led to a last-minute change, and how that was handled, I felt that the communication [with her] was lacking."